Bu çalışmanın amacı tüketicilerin İnternet’ten alışveriş yapma niyetlerini etkileyen faktörlerin satın alma niyeti üzerindeki etkisini bir model önerisi sunarak ortaya koyarak, bu etkilerin güçlerini sıralandırabilmektir. İnternet’in her alanda hayatı kolaylaştırdığı günümüzde, tüketiciler de yeni deneyimler ve satın alma yollarını öğrenmektedir. Tüm bu gelişmeler karşısında tüketicilerin verdiği tepkilerin araştırılması ve yeni örüntülerin belirlenmesi gerekmektedir. Ampirik araştırma sonucunda 419 katılımcıdan kullanılabilir veri toplanmıştır. Yapısal eşitlik modelinin sonuçlarına göre ürün ve finansal risk boyutu satın alma niyeti ile ters yönlü bir ilişkiye sahiptir. Erişilebilirlik, ürün çeşitliliği ve uygun fiyat boyutları İnternet’ten satın alma davranışı üzerinde pozitif etkiye sahiptir. Crespo, A. H., del Bosque, I. R., & de los Salmones Sanchez, M. G. (2009). The Influence of Perceived Risk on Internet Shopping Behavior: A Multidimensional Perspective. Journal of Risk Research, 12(2), 259-277. Dağtaş, E., & Yıldırım, O. (2015). İnternet ve Sosyal Ağlar Dolayımlı Gündelik Yaşam Pratikleri: Anadolu Üniversitesi Öğrencileri Üzerine Mikro Alan Araştırması. folklor/edebiyat, 21(83), 149-180. Dholakia, U. M. (2001). A Motivational Process Model of Product Involvement and Consumer Risk Perception. European Journal of marketing, 35(11/12), 1340-1362. Ganesh, J., Reynolds, K. E., Luckett, M., & Pomirleanu, N. (2010). Online Shopper Motivations, and E-Store Attributes: An Examination of Online Patronage Behavior and Shopper Typologies. Journal of Retailing, 86(1), 106-115. Hair, J. F., Black, B., Babin, B., Anderson, R. E., & Tatham, R. L. (2006). Multivariate Data Analysis. Pearson Publications. 6. Ed., England. Hong, I. B. (2015). Understanding the Consumer's Online Merchant Selection Process: The Roles of Product Involvement, Perceived Risk, and Trust Expectation. International Journal of Information Management, 35(3), 322-336. Jiang, L., Yang, Z., & Jun, M. (2013). Measuring Consumer Perceptions of Online Shopping Convenience. Journal of Service Management, 24(2), 191-214. Jun, M., Yang, Z., & Kim, D. (2004). Customers' Perceptions of Online Retailing Service Quality and Their Satisfaction. International Journal of Quality & Reliability Management, 21(8), 817-840. Jung, K., Cho, Y. C., & Lee, S. (2014). Online Shoppers' Response to Price Comparison Sites. Journal of Business Research, 67(10), 2079-2087. Konuş, U., Verhoef, P. C., & Neslin, S. A. (2008). Multichannel Shopper Segments and Their Covariates. Journal of Retailing, 84(4), 398-413. Kurtuluş, K., Kurtuluş, S., Yeniçeri, T., & Yaraş, E. (2005). The Role of Psychographics in Explaining Store Brand Buying Behavior. Boğaziçi Journal, 19(1-2), 99-113. Lester, D. H., Forman, A. M., & Loyd, D. (2006). Internet Shopping and Buying Behavior of College Students. Services Marketing Quarterly, 27(2), 123-138. Mosteller, J., Donthu, N., & Eroglu, S. (2014). The Fluent Online Shopping Experience. Journal of Business Research, 67(11), 2486-2493. Nepomuceno, M. V., Laroche, M., & Richard, M. O. (2014). How to Reduce Perceived Risk When Buying Online: The Interactions between Intangibility, Product Knowledge, Brand Familiarity, Privacy and Security Concerns. Journal of Retailing and Consumer Services, 21(4), 619-629. Pappas, N., & Pappas, N. (2017). The Complexity of Purchasing Intentions in Peer-To-Peer Accommodation. International Journal of Contemporary Hospitality Management, 29(9), 2302-2321. Peter, J. P., & Ryan, M. J. (1976). An Investigation of Perceived Risk at the Brand Level. Journal of marketing research, 13(2), 184-188. Scarpi, D., Pizzi, G., & Visentin, M. (2014). Shopping For Fun or Shopping To Buy: Is It Different Online and Offline? Journal of Retailing and Consumer Services, 21(3), 258-267. Sperber, A. D. (2004). Translation and validation of study instruments for cross-cultural research. Gastroenterology, 126(1), S124 S128. Stone, R. N., & Grønhaug, K. (1993). Perceived Risk: Further Considerations for the Marketing Discipline. European Journal of marketing, 27(3), 39-50. Taylor, J. W. (1974). The Role of Risk In Consumer Behavior. The Journal of Marketing, 54-60. Terblanche, N. S. (2018). Revisiting the Supermarket In-Store Customer Shopping Experience. Journal of Retailing and Consumer Services, 40, 48-59. Turan, A. H. (2008). İnternet Alışverişi Tüketici Davranışını Belirleyen Etmenler: Geliştirilmiş Teknoloji Kabul Modeli (E-TAM) İle Bir Model Önerisi. Akademik Bilişim-2008, 723-731. Turan, A. H. (2011). İnternet Alişverişi Tüketici Davranişini Belirleyen Etmenler: Planli Davraniş Teorisi (Tpb) İle Ampirik Bir Test. Doğuş Üniversitesi Dergisi, 12(1), 128-143. Wang, X., Yu, C., & Wei, Y. (2012). Social Media Peer Communication and Impacts on Purchase Intentions: A Consumer Socialization Framework. Journal of Interactive Marketing, 26(4), 198-208. Wellman, B., Quan-Haase, A., Boase, J., Chen, W., Hampton, K., Díaz, I., & Miyata, K. (2003). The Social Affordances of the Internet for Networked Individualism. Journal of Computer-Mediated Communication, 8(3), 0-0. Yakın, V. (2011). İnternet Perakendeciliği ve Ağızdan Ağıza Pazarlama İlişkisi; Tuğla Duvarlar Yıkılabilir mi? Akademik Bakış Dergisi, 27, 1-18. Yücel, İ. (2012). Examining the Relationships among Job Satisfaction, Organizational Commitment, and Turnover İntention: An Empirical Study. International Journal of Business and Management, 7(20), 44- 58. ISNAD YARAŞ, Eyyup , YETKİN ÖZBÜK, Meltem , AYDIN ÜNAL, Duygu . "Factors Affecting Consumers' Intention to Purchase Online". 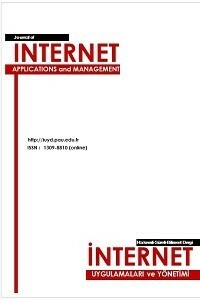 Journal of Internet Applications and Management 8 / 2 (December 2017): 63-74.